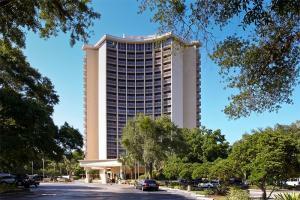 This 325 room hotel overlooks Lake Buena Vista and the spectacular Walt Disney World Resort®. As a guest of this Official Walt Disney World® Hotel, you'll can enjoy the benefit of Extra Magic Hours, giving you extra time at one of the Walt Disney World® Theme Parks each day. The rooms are equipped with HDTVs, free Wi-Fi, and other amenities to ensure your comfort. Relax and enjoy the fireworks from your balcony, or cool off in the pool after a long day at the park. A children's pool, fitness center and game room are also available. The hotel offers complimentary shuttle service to all four Disney parks.